Why Skin Care? Since the skin is our largest organ, doesn’t it make sense to pay attention and care for it properly? Our bodies are always sending us signals of distress. We just need to listen. For example, if your skin is inflamed, it may reflect internal inflammation or toxicity. At Sacred Moments Massage & Healing Center, we believe in the importance of forming a trusting relationship with a Licensed Skin Care Professional: A professional who knows & understands YOUR skin. Since your skin absorbs whatever you put on it, we also strongly feel it is important to carefully consider the skin and body care products you use. Did you know, much of what we place on our skin is absorbed into our bloodstream? Just think about nicotine, birth control & pain medication patches. In 2005, the Environmental Working Group published a combination of two studies that found toxic chemicals in the umbilical cord blood of newborn babies born in the U.S. in the fall of 2004. YIKES! Did you also know, government regulations allow virtually any ingredient to be used in the manufacture of products that we use daily on our skin, hair, and nails, and in the water we drink? Alarming, right? The Food & Drug Administration (FDA) establishes the regulations and standards in the United States regarding the manufacture of drugs & food. The problem is that they do not pay as much attention to skin care and make-up as they should, thereby allowing some very harmful chemicals to be used in creating almost every product that is mass marketed. Keep in mind, most of these compounds are absorbed easily by the skin, yet the body has no way of ridding itself of them. The toxins remain in your intestine and eventually get spread through the body, possibly causing damage to your organs. At Sacred Moments Massage & Healing Center, we help you avoid harmful chemicals by offering Organic & All Natural Skin Care. We believe that you should understand what is in your skin care products. Mother Nature supplies us with everything we need. She has so many amazing ingredients to offer, and we strive to bring you the very best. We are here to help you learn about the latest ingredients and their benefits, whether you are looking for natural botanicals, pure organics, or the newest anti-aging peptides. But wait! We know and understand in order to have healthy, beautiful skin and to maintain younger looking skin it takes more than just natural products. Our Licensed Skin Care Specialist does more for you than just apply product. She becomes your ally in helping you maintain your skin care goals. What you see on the outside begins with what is happening on the inside! Together you will look at the importance of consuming water, certain foods, vitamins and possibly herbal supplements. 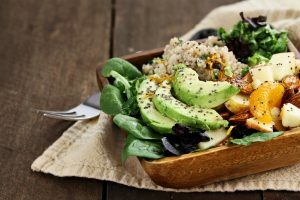 It goes without saying that eating natural, organic whole foods will lead not only to better health in general, but will also allow your skin to achieve that healthy glow! Eat your GREENS! Following these guidelines could lead to improvements in skin conditions such as eczema, psoriasis, and dry skin. Not only will your skin be healthier, but you will also be healthier overall. And, remember, skin can be a good representation of your state of health. We believe the relationship between a client and Esthetician is similar to that of a patient and doctor. It must be honest and real! Have you ever gone to get your lip or brows waxed and had the skin unexpectantly lift off? You always wax and never have any problems. Why now? Did you forget to tell your Esthetician about the changes in medications or maybe the recent use of RetinA, retinols or AHAs? It happens more often than most people realize. Your relationship with your Esthetician is based on clear, concise communication between both parties. What about that Botox injection or filler? (Hey, we’re not here to judge!) Did you know it’s best to wait one week before receiving any skin care treatments? The reason for this is any massage/rubbing after an injection could cause the toxins to migrate to another area of the face. And, we do not want that! Let’s be honest, our Licensed Skin Care Specialist wants you to be happy with your treatments and we want your skin looking its best, just as much as you do! Also, because only about two-fifths of skin conditions are evaluated by dermatologists, our esthetician can be an essential facet of your skin care team. She will always be on the look-out for unusual moles or growths, unusual changes or anything suspicious she feels may need to be brought to your dermatologist’s attention. We believe skin care is not a luxury. It is a treatment of the largest organ on the body. Everything from rosacea, acne and anti-aging can be addressed and our Esthetician can recommend proper home care using quality organic/all natural products. Your relationship begins on your initial visit, when you will be asked to share detailed information regarding your skin, health, and product usage. Arriving on time for your visit with your Skin Care Specialist is crucial to complete the service you have requested, or that is recommended for your skin. Listed below are some of the major questions for success in treatments. Do you tan? Easily or burn? Are you taking antibiotics oral/topical? Tetracycline? Are you using Retin A? Accutane? Have you recently had any cosmetic procedures such as laser resurfacing, Botox, or any other enhancers/fillers? Prior to today, what types of treatments have you done on your skin at home? Professionally? Results? Are you pregnant? Do you take oral contraceptives? Do you prefer simple routines at home like cleanse and moisturize, or do you like to add in additional products? What are your top 3 concerns for your skin? These are an example of just a few important questions that can be asked. On your future visits, it is extremely important to continue to share any lifestyle, medication or product changes with our Esthetician. Great communication will provide excellent results on your skin. Sacred Moments Massage & Healing Center would love to help and assist you in obtaining and maintaining your skin care goals. We offer complimentary skin care consultations for those that are in the Oviedo, Winter Springs, Lake Mary, Sanford, Orlando and Casselberry areas. We proudly offer Servello; nature-based aromatherapy products for the face! Servello skincare products are unique, body conscious formulas uniting pure therapeutic essential oils, plant extracts, antioxidants, vitamin rich plant and vegetable oils, and medicinal herbs. Fashioned for those who desire naturale. Great for maintenance on the go! A thorough cleansing, exfoliation, facial massage & hydration. Our therapeutic all natural/organic products deliver individual results specific to your personal skin care needs. Includes cleanse, exfoliation, steam, extractions (if needed), customized treatment mask, serums, & moisturizer. Also includes facial, neck, scalp, hand & foot massage. Great for acne & problematic skin! With all the luxuries of a Sacred Moments Signature Facial, the High Frequency Facial kills bacteria, increases glandular activity, decongests puffiness, fades dark circles, increases collagen & elastin production and stimulates circulation. Dry Skin benefits from the stimulation of the oil glands through its’ skin warming effect. This proactive anti-aging and antioxidant treatment actively removes outer layers of skin cells while promoting increased cellular regeneration, deeply hydrates and plumps the skin, stimulates collagen production, refines & evens skin tone and assists with hyper pigmentation issues. High in antioxidants, vitamin’s A, C, & B. Ideal for fine lines, sun damage, and mature skin. Highly recommended for Acne! Cleansing, exfoliation, extractions, treatment mask, moisturizer, and facial, scalp, hand & foot massage included. Deeply exfoliate dead skin cells, brighten dull skin, help even pigmentation, hydrate, stimulate collagen production, and savage free radicals with 15% AHA, Organic Aloe Vera, Hyaluronic Acid, Lemon Peel Bioferment, and antioxidant rich organic Raspberry, Blueberry & Cranberry Extracts. 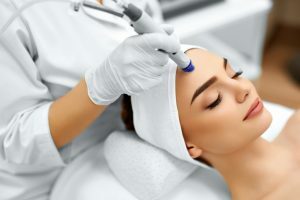 An LED facial uses wavelengths of UV-free LED lights that claims to boost collagen production and is used to treat acne, wrinkles, facial lines and sun damaged skin. LED skin treatments may encourage normal cell turnover and the production of collagen. Different colors and their wavelength frequencies affect different depths of the skin, creating diverse customization in the hands of our therapist. Red: Promotes blood circulation, and stimulates formation of collagen to reduce lines and wrinkles. It is excellent for anti-aging and for use to repair damaged tissue. Blue: Eases inflammation, making it spectacular for rosacea and redness-prone skin. It can get to the core of acne eruptions, reducing the proliferation of acne bacteria. Green: Works to promote healing, aiding absorption of nourishing ingredients, reducing discolorations, evening out pigmentation and calming capillary dilation. Our esthetician will customize a treatment plan for your specific skin challenges. Your painless treatment lasts approximately 20 minutes and requires no recovery time. Micro-Needling $125 Micro-needling stimulates the growth of collagen and elastin, which is the key to new, youthful-looking skin. It is considered one of the most powerful ways to stop aging in its tracks and prevent new fine lines and wrinkles from forming. With its ability to trigger the generation of new skin cells, just a few sessions (we recommend three) of micro-needling will noticeably reduce fine lines, crow’s feet, and deep wrinkles on the forehead. Skin Analysis, Cleanse, Tone, Exfoliate, Extractions, Masque, Serum, Moisturize, Warm Scented Towels, Steam & Massage. We Can Help! Call Us! 407-977-7332.